Elements Applied: Green parts are commonly applied in herbal medicine. Other: saponin, resin, mucilage gums. Used For: The herb is known to induce expectoration, promote urination, and relieve inflammations. It is conventionally applied for rheumatism and bronchitis, but modern herbalists most frequently prescribe it for skin conditions. It is applied both topically and orally for acne, psoriasis, and eczema. Additionally, it is used for cradlecap in infants. Heartsease is considered potent in relieving painful and frequent micturation, associated with cystitis. Due to its rutin and salicylate content, the herb is efficient in treating inflammations, and can thus be applied to help treat arthritic conditions. Saponins, found in the herb, are responsible for its expectorative capacity, and the presence of mucilage helps relieve chest congestion. Heartsease is applied for a wide variety of respiratory conditions, like acute coughing and bronchitis. As its flowers are rich in rutin, the plant is used to strengthen capillaries, relieve water retention in body tissues, and treat atherosclerosis, thus also decreasing arterial tension. 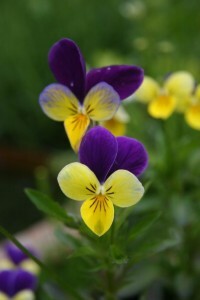 Heartsease can be used for mild constipation. Additional Info: The herb is indigenous to the United Kingdom. Preparation and Intake: To prepare an infusion, take one teaspoon of dry herb extract for a cup of boiling water, and steep for ten to fifteen minutes. The result is taken thrice per day.